Like every other disgruntled consumer, I am used to buying ordinary supermarket items at exorbitant prices. I’m used to seeing UK foods marked with a £1.00 price tag, only to be sold at nearly 3 times the exchange rate, however it really boils my blood when I come across an item marked as ‘15% more free sheets’, being sold with a more than 15% mark up!! To make matters worse, the regular item, with 88 sheets was sitting just above it for $7.15. Yesterday I went into Big B supermarket, picked up the roll for $8.36 then backed tracked to see if I was indeed getting a bargain. To my dismay, I saw the regular item on the shelf being sold at a different price. I promptly complained to manager Mr. Christopher Durant, who assured me he will mention it to the powers that be. My reply was “I have no doubt that this is something they’re used to doing and I’m pretty sure it will fall on deaf ears”. Anyway, on my way out, Mr. Durant caught up to me to let me know I had “got it wrong”, as I was comparing the tissue roll I bought with a different Kleenex brand. I insisted that I was indeed correct and followed him to the shelf where I saw the ‘regular’ 88 sheet roll at more than $1 less. 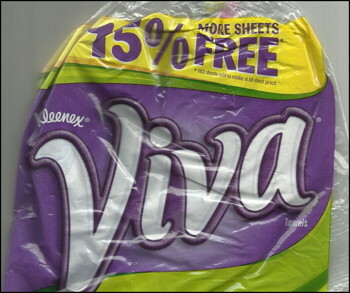 In Mr. Durant’s haste to point out my mistake, he brought my attention to the fine print under the ‘15% more free sheets’, where it read, ” *102 sheets sold to to the retailer at 88 sheet pack”. Needless to say, he didn’t have much more to say after that. I will be sending this email to the Supercentre head office, also to whatever trading standards/consumer watch programs we have ‘representing’ us. Sign me: Fed up consumer!